"The Marine’s Return is so well written. I love the characters, and reading about the familiar characters from the other two books I read was so enjoyable. Chad and Lexi’s interactions are so much fun to read. In fact, you’re going to love how two other characters come together too! . . . 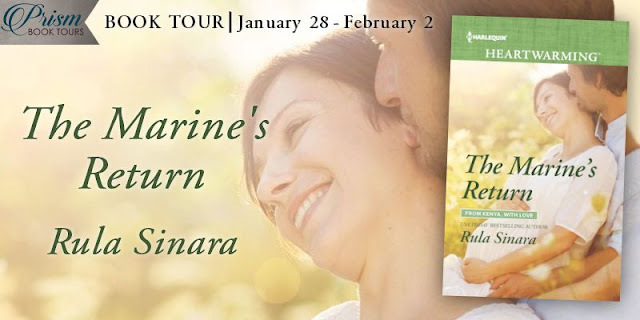 I highly recommend The Marine’s Return because of the amazing characters, descriptive setting, exciting story line, and sweet romance." "This novel addresses some of the many sacrifices made by those in armed forces and their families. Additionally it address, illegal poaching, and the inner strength individuals fin within themselves. . . The characters feel very real and the background scenes are vividly portrayed in script. 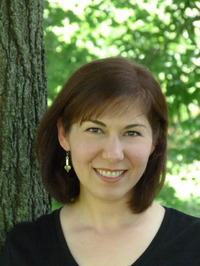 The reader will, truly, feel herself/himself connected to the characters and the African terrain." "I really did enjoy this story. This is the first book in the series that I have read and I hope to read more from this author. I enjoyed the creative characters and the way they seem so realistic. I have not read very many books set in Kenya, so this part of the book was very interesting to me. I enjoyed the scenes at the clinic as well as the surrounding areas. The talk about the wildlife, and especially how they could he at the sounds of the wild." "Kenya is a country on my list of places I would love to visit. And I enjoyed being able to do that vicariously through The Marine’s Return." "Compelling and emotionally gripping, The Marine’s Return concludes the epic six-book series that will live on in my memory and that I highly recommend. . . . Romance fans will be delighted with Chad and Lexi’s story, but The Marine’s Return is so much more than a typical romance. Sinara’s writing flows easily across the page, conveys rich and vivid characters and scenes, and captured me emotionally from the first page." "This is a book that everyone should read. . . . This was a fun book to read, and I liked there was a lot of family in it. Even though it is part of a series, I did not feel as though I was missing any information, and was a great stand alone for me. . . . 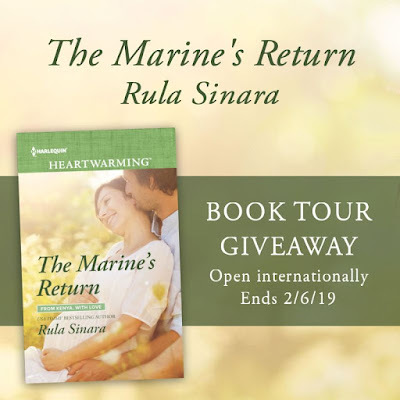 The ending was a great fit, and I enjoyed it"
"The Marine’s Return by Rula Sinara is fabulous. I thoroughly enjoyed the story, the characters, the setting, and family. Lexi and Chad are such beautiful characters, their story adds splendidly to the others in the From Kenya, With Love Series. I haven’t read the first five books but if I find the time I will be reading them. We are given a glimpse of the others throughout the story, and I fell in love with all of them." "I enjoyed reading about the culture and way of life and the different struggles and dangers they face there. . . . Good story line and characters! Clean romance. I enjoyed reading it!" "Another winner! . . . I love each story in the From Kenya…with Love series–not only do the characters feel like old friends (a feat that they manage even if you haven’t read all–or any–of the other series books) but the setting is absolutely amazing. Even though I’ve never been to Kenya, I almost feel as if I have once I finish one of these books. The Marine’s Return is no exception to this rule! . . . I really enjoyed Chad and Lexi’s story. It’s a solid blend of relationship drama (past and present romantic relationships, as well as family ones) and situational." "The first book that I have read by this author; last book in the series; the setting is in Africa, and I really didn’t know what to expect. Well, let me tell you this book surprised me in ways that I never saw coming. Seriously. I read a lot of Heartwarming books but this one just grabbed me and wouldn’t let go. . . . I tell you this every time I read a Harlequin Heartwarming story, please read this line. Its character heavy, sweet/slow building romance that anyone can read and in the end finish with a smile on their face. I do every time and this time, I’m still thinking about it." 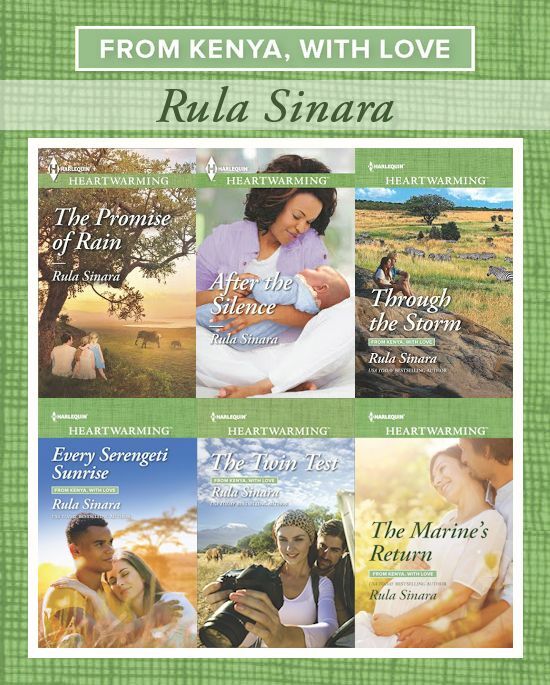 "With a touch of mystery, a second romance thread, and appearances from characters from the other books, Rula Sinara brings her series full circle while displaying the beauty and dangers of life in Africa." "Chad and Lexi were great characters that I enjoyed getting to know. The story is one that was sweet, clean and heartwarming. It did tug at my heart at times, too. . . . Great read!" "A great ending to the From Kenya, With Love series! . . . The story line was quickly entrenched in emotions and intrigue, and watching Chad and Lexi connect was rewarding. Getting to catch up with so many of the past members of the series was a wonderfully fitting ending. Absolutely loved it and sorry to see the series end!" "If you haven’t read this series yet, you simply must. Start at the beginning for full effect, though each book can be read as a standalone. The Marine’s Return engages readers from start to finish, and Chad and Lexi’s multi-dimensional stories tug at the heart." 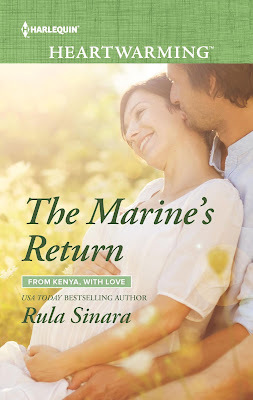 "Take a trip to Kenya with Rula Sinara’s final From Kenya, With Love book, The Marine’s Return. It’s an adventure, full of romance and danger, that contemporary-romance readers shouldn’t want to miss." "THE MARINE'S RETURN takes readers to remote Africa as a woman tries to bring medical help to indigenous tribes and as a man tries to come to terms with his new reality after losing a limb serving in the military. The story is full of heart, conviction, friendship, family, and sweet romance. Recommended to fans of the series and of sweet romance. . . . This was a sweet story that tugged on my heart. An excellent ending to the series. I'm looking forward to more from this author!"